View More In Breast Pumps - Page 5. The perfect starter set for the breast pumping mom! Includes 20 Store 'N Pour milk collection bags with 2 flange adapters, 10 NoShow premium disposable breast pads, 4 breast milk storage bottles, breastfeeding reference guide, and an up-to-date milk storage guideline card. 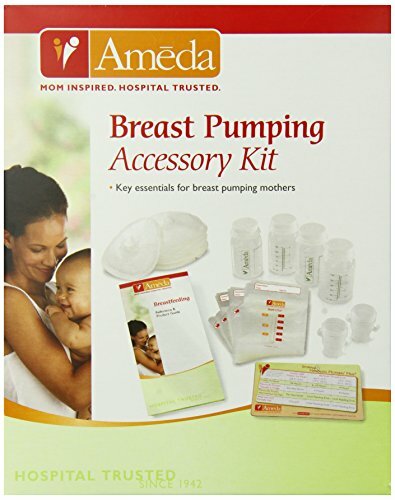 PROTECT YOUR LIQUID GOLD: Ameda Store N Pour Breast Milk Storage Bags feature an easy-close zip seal to prevent breast milk leakage during storage as well as a unique tear-and-pour spout to help prevent spills while transferring milk from bag to bottle. EXTRA STORAGE: The Ameda Breast Milk Storage Bottles can be used to safely store expressed milk in the fridge or freezer. Clearly marked to measure your milk, they have space for clear labeling & universal threading compatible with all standard pump kits. If you have any questions about this product by Ameda, contact us by completing and submitting the form below. If you are looking for a specif part number, please include it with your message.